A Meaningful Life, A Better World: An Updated "How To Win Friends"
An Updated "How To Win Friends"
How To Win Friends and Influence People is a classic, and absolutely required reading for anyone who wants to make the world a better place. 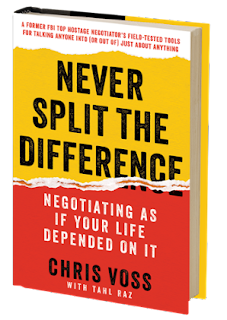 A new book – Never Split the Difference – picks up where Carnegie left off. Ostensibly a book about negotiation, it really is a book about dealing with others – how to read them, listen to them, and discern and understand their motivations. While the entire book is interesting, with lessons framed in the context of various negotiations, here are some excerpts I found particularly insightful for anyone who wants to open anyone else's heart and mind to new ideas and possibilities. Tactical empathy is understanding the feelings and mindset of another in the moment, and also hearing what is behind those feelings so you increase your influence in all the moments that follow. It's bringing our attention to both the emotional obstacles and the potential pathways to getting an agreement done. It's emotional intelligence on steroids. [T]he Behavioral Change Stairway Model (BCSM) ... proposes five stages – active listening, empathy, rapport, influence, and behavioral change – that take any negotiator from listening to influencing behavior. [T]he Golden rule is wrong. The Black Swan rule is: don't treat others the way you want to be treated; treat them the way they need to be treated.